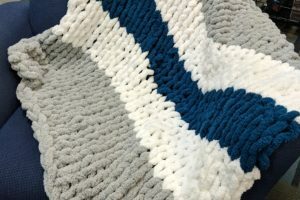 Join us for a fun evening of crafting and go home with a completed Chunky Knit Blanket. All you need is your own yarn, and your own two hands! These are adorable and make great gifts or keep it for yourself! 6 or 7 weight “Chunky” or “Jumbo” yarn in your choice of color and cost. More yarn equals larger throw blanket.There are many brands and price points available, so choose wisely. I do not recommend “loops” or “pom-poms”! Feel free to shop around for yarn! Michael’s, Hobby Lobby, and Joann all carry yarn and offer coupons on a regular basis. You have time to grab a skein or two a week if cost is a factor. My sample piece is the Walmart Mainstays brand and was 5.88 per skein, and it works up quick and cozy in no time. I used about three skeins and measures 42×43 inches, a nice baby blanket or small lap/car blanket. Please contact Krista Jackson @417-468-3335 or message the Webster County Library Facebook page if you have any questions or must cancel your registration.